I have been a bit absent from my blog because I have been working on baby proofing our living room. Since baby proofing doesn’t always have an end result of attractive, I thought I would add some personalized pillows to our fireplace. 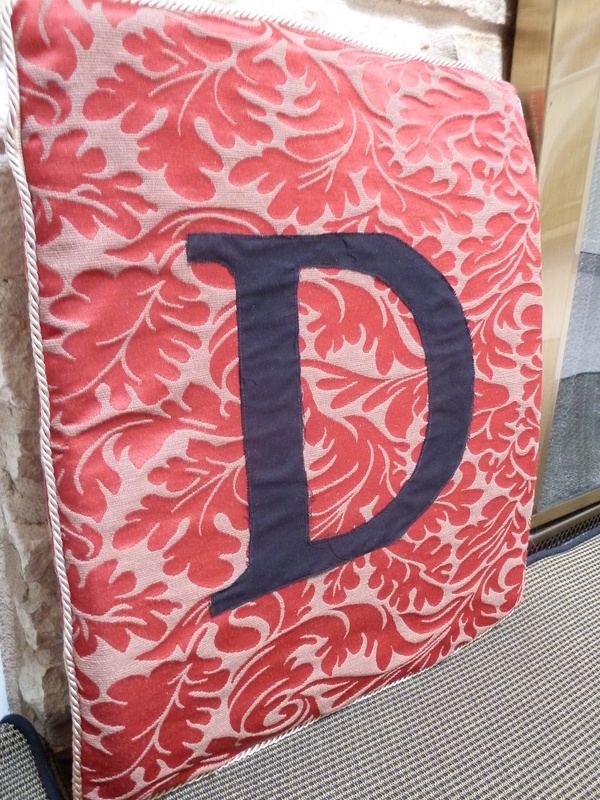 Here is my tutorial for a monogramed pillow. My pillow forms were 1x15x17 and I cut my fabric a half inch plus 5/8 seam allowance larger than the dimensions. Cut four of these pieces. Next I went to Google and searched “D letter” and found oodles of varying scripts of the letter D. I chose the one I liked and printed it, cut it out and used it as a template. 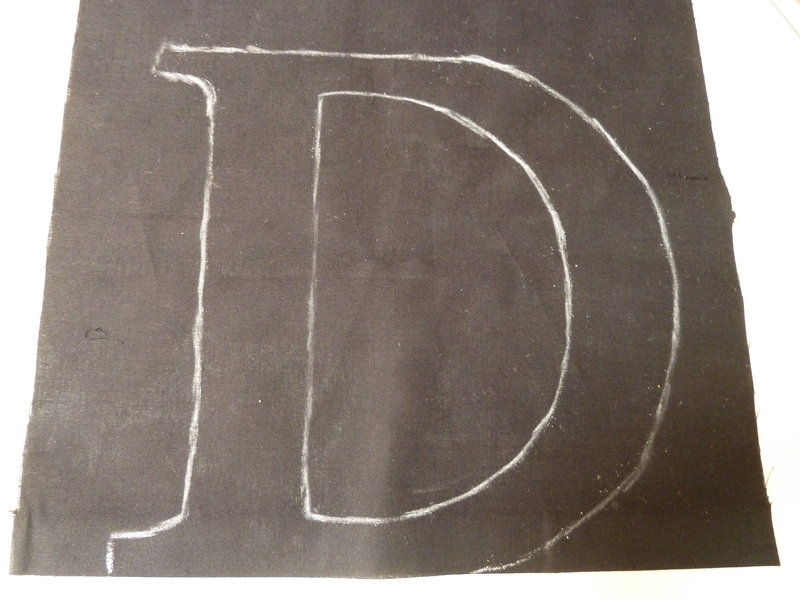 Next trace your letter with chalk on your contrasting fabric. A fabric marker will work as well but since my fabric was black my marker wouldn’t show up. Now if you don’t want to deal with the remnant of the chalk dust you can flip your letter over and do the tracing on what would be the back side of your letter. Cut this out and add some strips of the fusible web by following the package directions. Try and add your web to the edges of your letter which help when you go to sew it down. Measure equal distance from top and bottom and side to side for placement of your letter on one front piece of your pillow fabric. Tack your letter down using the other side of the fusible webbing with your iron. With a zig zag stitch all edges of your letter onto the pillow fabric. Place right sides of your fabric (letter should be on the inside) together sandwiching the piping. 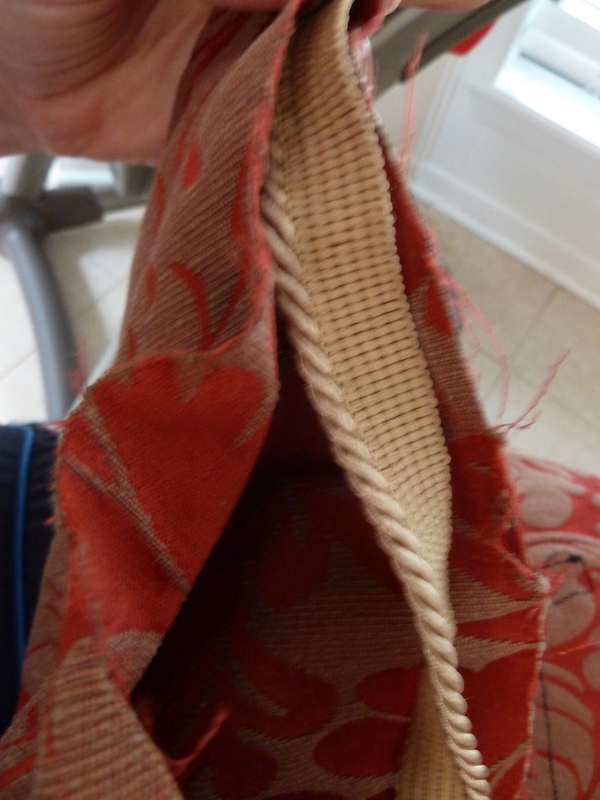 Make sure the pretty pipped edge you want to line the pillow is facing inside. Using your zipper foot or piping foot sew up against the piping. All raw edges together. My pillows used about 3 1/2 yards of piping. I chose to use strips of piping instead of keeping it a continuous piece since I got several pieces of mine on sale and didn’t have enough for a continuous piece. If you chose this method make sure you extend your piece of pipping a bit longer than the edge of the fabric and when sewing your seams leave about an inch to place the next piece of piping over the piece just sewn like a plus sign. Note–Now you could sew your piping onto one side of your fabric first but that is double work so I chose to do the fast method of sandwiching and sewing. Pin if you wish. Sew 3 1/2 sides together leaving (make sure you stop an inch from the edge to place the next piece of piping in the seam) a hole large enough to stuff your pillow into the casing. 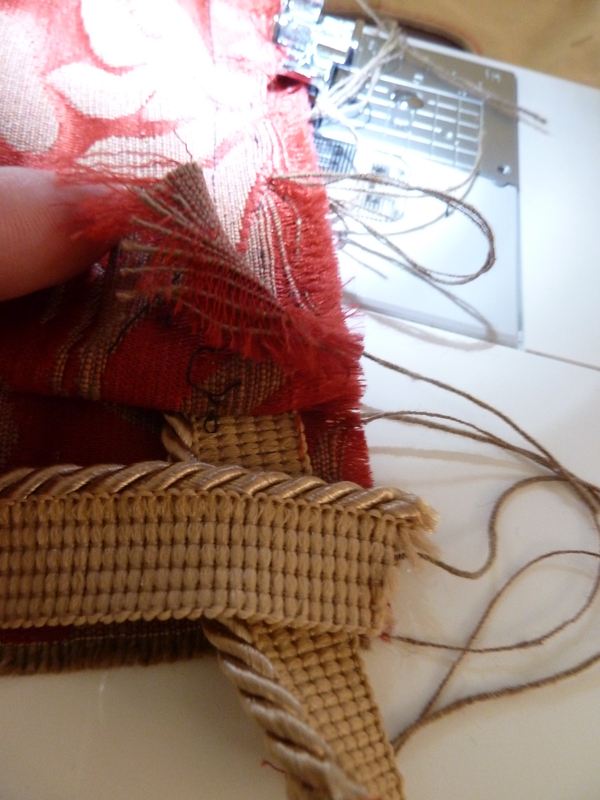 Stuff your pillow into your casing and hand stitch the opening close using a blind stitch. I chose to enclose my pillows so little hands didn’t explore and pull out the foam. You can put a zipper in or leave an opening in the back. More on these techniques later. Done! Easy! These are going to work great as back cushions for our fireplace seating. Now go and personalized some pillows to baby proof or update your home. 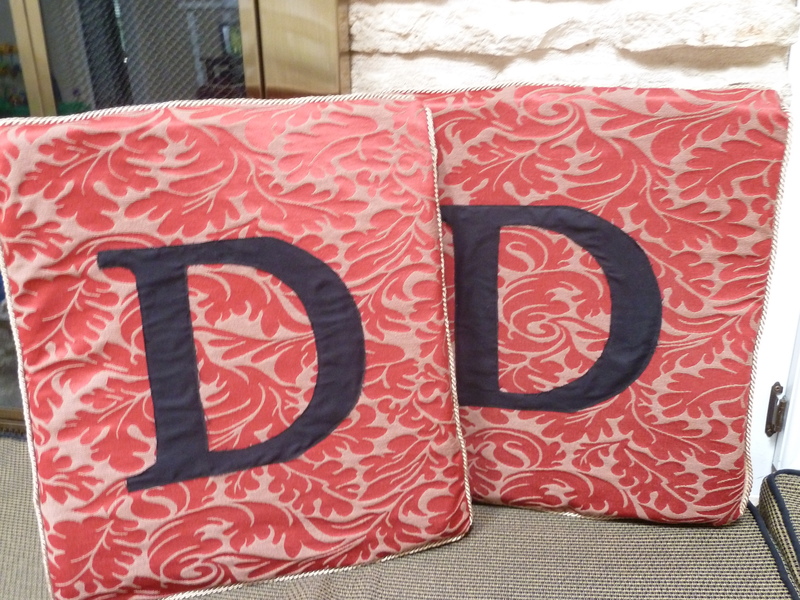 Posted in Tutorials and tagged monogramed pillow, pillow tutorial. Bookmark the permalink.